The Nyingma tradition is the oldest of the four major schools of Tibetan Buddhism (the other three being the Kagyu, Sakya and Gelug). "Nyingma" literally means "ancient," and is often referred to as Ngangyur (IPA: [ŋaɲɟuː], Tibetan: སྔ་འགྱུར་རྙིང་མ།, Wylie: snga 'gyur rnying ma, "school of the ancient translations" or "old school") because it is founded on the first translations of Buddhist scriptures from Sanskrit into Old Tibetan in the eighth century. The Tibetan alphabet and grammar was created for this endeavour. Statue of Padmasambhava, a central mytho-historical figure of the Nyingma tradition, Bhutan. The Nyingma particularly believes in hidden terma treasures and place an emphasis on Dzogchen. They also incorporate local religious practices and local deities and elements of shamanism, some of which it shares with Bon. The Nyingma tradition actually comprises several distinct lineages that all trace their origins to the Indian master Padmasambhava. Traditionally, Nyingmapa practice was advanced orally among a loose network of lay practitioners. Monasteries with celibate monks and nuns, along with the practice of reincarnated spiritual leaders, are later adaptations. In modern times, the Nyingma lineage has been centered in Kham and has been associated with the Rime movement. Traditional Nyingma texts see themselves as a lineage which was established by Samantabhadra (Güntu Sangpo), the “primordial buddha” (Adi Buddha) and who is also the embodiment of the Dharmakāya, the "truth body" of all buddhas. Nyingma also sees Vajradhara (an emanation of Samantabhadra) and other buddhas as teachers of their many doctrines. Samantabhadra's wisdom and compassion spontaneously radiates myriad teachings, all appropriate to the capacities of different beings and entrusts them to "knowledge holders" (vidyadharas), the chief of which is Dorjé Chörap, who gives them to Vajrasattva and the dakini Légi Wangmoché, who in turn disseminate them among human siddhas. The first human teacher of the tradition was said to be Garab Dorje (b. 55 c.e. ), who had visions of Vajrasattva. Padmasambhava is the most famous and revered figure of the early human teachers and there are many legends about him, making it difficult to separate history from myth. Other early teachers include Vimalamitra, Jambel Shé Nyen, Sri Simha, and Jñanasutra. Most of these figures are associated with the Indian region of Oddiyana. Buddhism existed in Tibet at least from the time of king Thothori Nyantsen (fl.173?-300? CE), especially in the eastern regions. The reign of Songtsen Gampo (ca.617-649/50) saw an expansion of Tibetan power, the adoption of a writing system and promotion of Buddhism. The explosive developments were interrupted in the mid-ninth century as the Empire began to disintegrate, leading to a century-long interim of civil war and decentralization about which we know relatively little. The early Vajrayana that was transmitted from India to Tibet may be differentiated by the specific term "Mantrayana" (Wylie: sngags kyi theg pa). "Mantrayana" is the Sanskrit of what became rendered in Tibetan as "Secret Mantra" (Wylie: gsang sngags): this is the self-identifying term employed in the earliest literature. Part of the Dzogchen text The cuckoo of awareness, from Dunhuang. From this basis, Vajrayana was established in its entirety in Tibet. From the eighth until the eleventh century, this textual tradition (which was later identified as 'Nyingma') was the only form of Buddhism in Tibet. With the reign of King Langdarma (836–842), the brother of King Ralpachen, a time of political instability ensued which continued over the next 300 years, during which time Buddhism was persecuted and largely forced underground because the King saw it as a threat to the indigenous Bön tradition. Langdarma persecuted monks and nuns, and attempted to wipe out Buddhism. His efforts, however, were not successful. A few monks escaped to Amdo in the northeast of Tibet, where they preserved the lineage of monastic ordination. The period of the 9-10th centuries also saw increasing popularity of a new class of texts which would later be classified as the Dzogchen "Mind series" (Semde). Some of these texts present themselves as translations of Indian works, though according to David Germano, most are original Tibetan compositions. These texts promote the view that true nature of the mind is empty and luminous and seem to reject traditional forms of practice. An emphasis on the Dzogchen textual tradition is a central feature of the Nyingma school. From the eleventh century onward, there was an attempt to reintroduce Vajrayana Buddhism to Tibet. This saw new translation efforts which led to the foundation of new Vajrayana schools which are collectively known as the Sarma "New translation" schools because they reject the old translations of the Nyingma canon. It was at that time that Nyingmapas began to see themselves as a distinct group and the term "Nyingma" came into usage to refer to those who continued to use the "Old" or "Ancient" translations. Nyingma writers such as Rongzom (ca. 11th century) and Nyangrel were instrumental in defending the old texts from the critiques of the Sarma translators and in establishing a foundation for the mythology and philosophy of the Nyingma tradition. Rongzom Chokyi Zangpo was the most influential of the 11th century Nyingma authors, writing "extensive exoteric and esoteric commentaries." He upheld the view that sutra teachings such as Madhyamaka were ultimately inferior to the teachings found in the Buddhist Tantras and Dzogchen. Rongzom also wrote a commentary on the Guhyagarbha tantra, which is the main tantra in the Nyingma tradition. The period of the new dissemination of Buddhism which saw the rise of the Sarma schools also saw the proliferation of fresh Nyingma Dzogchen texts with fresh doctrines and meditative practices, mainly the 'Space class' (longde) and the 'Instruction class' (Menngagde) (11th-14th century), particularly important were the seventeen tantras. To vitalize the legitimacy of these new texts against the criticism of the Sarma schools, the Nyingma school expanded the tradition of the "Terma", which are said to be revealed treasure texts by ancient masters, usually Padmasambhava, which had been hidden away and then discovered by tertons (treasure revealers). The first tertons dating to the 11th century were Sangyé Lama and Drapa Ngönshé. Another important terton, Nyangrel Nyima Özer (1136-1204), was the principal promulgator of the Padmasambhava mythos, according to Janet Gyatso. Guru Chöwang (1212–70) was also influential in developing the myths of Padmasambhava. Nyangrel and Chögi Wangchuk (1212–1270) are known as the “sun and moon” of tertons, and along with Rikdsin Gödem (1337–1409), are called the "three grand tertons". By this period we see the establishment of three major classes of Nyingma literature; those translated and transmitted without interruption from the beginning of the Buddhist dissemination are called "transmitted precepts" (bka' ma), the hidden "treasures" are called gter ma and lastly there are those collected works (gsung 'bum) of individual Tibetan authors. Longchen Rabjampa, Drimé Özer (Longchenpa, 1308-1364, possibly 1369) is a central thinker and poet in Nyingma thought and Tibetan Buddhist philosophy. He is mainly known for his systematized integration and exposition of the major textual cycles such as the Menngagde in his various writings, which by his time had become central texts in the Nyingma tradition. His main writings include the Seven Treasuries (mdzod bdun), the "Trilogy of Natural Freedom" (rang grol skor gsum), the "Trilogy that Clears Darkness" ("mun sel skor gsum"), and the Trilogy of Natural Ease (ngal gso skor gsum). The 14th and 15th centuries saw the work of many tertons such as Orgyen Lingpa (1323–1360), Pema Lingpa (1346–1405), Sangye Lingpa (1340–1396) and Ratna Lingpa (1403–1479). Another key figure was Karma Lingpa (1326–1386), who wrote down an important work called "Profound Dharma of Self-Liberation through the Intention of the Peaceful and Wrathful Ones" which includes the two texts of the bar-do thos-grol, the "Tibetan Book of the Dead". 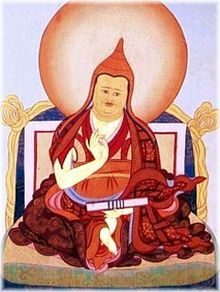 Lochen Dharmaśrī (1654–1717) wrote important commentaries on the Guhyagarbha tantra and his brother Terdak Lingpa (1646–1714) was the founder of the Mindrolling Monastery in 1670, one of the six major Nyingma monasteries. A later seminal figure in the development of the Nyingma system was Jigme Lingpa (1730-1798) "the greatest treasure finder of the eighteenth century", whose Longchen Nyingthig ("The Heart-essence of the Vast Expanse") is a systematization of the path which is one of the most widely used Nyingma Dzogchen teachings today. In 1848, the Nyingma monastic college of Dzogchen Shri Sengha (rdzogs chen srwi sengha), was founded in Kham by a charismatic teacher, Zhanphan Thaye (gzhan phan mtha' yas, 1800-), in association with the active participation of Do Kyentse (rndo mkhyen rtse). According to Georges Dreyfus, the Nyingma school had traditionally "relied on non-ordained tantric practitioners to transmit its teachings through authorized lineages." The foundation of this monastic school was a major shift in the Nyingma tradition, and is seen as a response to the growth of the Gelug school's hegemony which was based on a well organized system of monastic scholasticism and education. The sort of study and learning in this monastery was mostly based on exegetical commentary, a contrast to the more debate based Gelug education. In this way, the Nyingma school revitalized itself and presented itself as a legitimate rival to the Gelug school. The 19th century also saw the rise of the non-sectarian 'Rime' movement, led by Jamyang Khyentse Wangpo (1820-1892) and Jamgön Kongtrül (1813-1899) which sought to collect and print the teachings of the Sakya, Kagyu and Nyingma schools in response to the hegemonic influence of the Gelug school. Jamgon Ju Mipham Gyatso (“Mipham the Great”, 1846-1912) was born into an aristocratic family in 1846 in Kham, a province of eastern Tibet. Mipham was a student of Rime scholars like Kongtrül. Mipham composed authoritative works on both the Sutra and Vajrayana teachings as understood in the Nyingma tradition, writing extensively on Dzogchen and Madhyamaka. According to Karma Phuntsho, Mipham's work "completely revolutionised rNying ma pa scholasticism in the late nineteenth century, raising its status after many centuries as a comparative intellectual backwater, to arguably the most dynamic and expansive of philosophical traditions in all of Tibetan Buddhism, with an influence and impact far beyond the rNying ma pa themselves." Mipham's works have become the foundation of study for not only the Nyingma lineage, but the Kagyu lineage as well. They hold a central position in all Nyingma monasteries and monastic colleges. Following in the footsteps of Mipham, Khenpo Shenga was also an important figure in the revitalization of Nyingma monastic education by establishing the study of exoteric philosophy at Dzogchen Shri Sengha  through the use of classic Indian texts, which include the major works of Asanga, Nagarjuna and Aryadeva. Khenpo Shenga composed commentaries on these key texts and scholastic textbooks. He focused on the study of these texts as a way to avoid sectarian disputes by appealing to classic Indian material. The 19th century also saw the production of new Terma texts, particularly by Orgyen Chokgyur Lingpa (1829-1870), Péma Ösel Mongak Lingpa (1820–1892), and Dudjom Lingpa (1835–1904). Another important figure is Patrul Rinpoche (b. 1808), who wrote The Words of My Perfect Teacher, a key text on Nyingma preliminaries. Unlike Mipham, Rongzom did not attempt to harmonize the view of Mantra or Dzogchen with Madhyamaka. Like in other schools of Tibetan Buddhism, Nyingma teaches various forms of ngöndro, or preliminary practices which help prepare the mind for later meditations. These include the cultivation of "bodhicitta", the "four thoughts that turn the mind", and Vajrasattva purification practice. Deity Yoga is also a feature of Nyingma. The foremost deities (yidam) practiced by the Nyingma masters are Vajrakīla (Tib. Dorje Phurba) and Vajra Heruka (also Vishuddha Heruka; Tib. Yangdak Tratung, Wylie: yang dag khrag 'thung), the third of the Eight Herukas who closely resembles Śrī Heruka of the Chakrasamvara tantra. The three principle protectors of the Nyingma lineage are said to be Ekajaṭī (Wylie: e ka dza ti), Rāhula (Wylie: gza' ra hu la) and Dorje Legpa (Wylie: rdo rje legs pa, Sanskrit: Vajrasādhu). Other forms of practice like Lojong and subtle body practices such as Trul khor are also taught in Nyingma. Śrāvakayāna, the Vehicle of the Listeners or disciples. Pratyekabuddhayāna (Hinayana) the Vehicle of the Solitary Buddhas, the way of solitary meditation. Bodhisattvayāna (Mahayana) the Great or Causal Vehicle, the Vehicle of Enlightened Beings, is the way of those who seek or attain enlightenment for the sake or intention of liberating not just oneself, but all sentient beings from Saṃsāra. Kriyā (Wylie: bya ba'i rgyud) Tantra of Action which involves ritual, mantra repetition and visualization. Carya or Ubhaya (Wylie: u pa'i rgyud or spyod pa'i rgyud) Tantra of Conduct — equal amounts of meditation and symbolic rituals. Anuyoga (Wylie: rjes su rnal 'byor) Subsequent Yoga — controlling breathing and energy (nervous and sexual). Atiyoga (Dzogchen) (Wylie: lhag pa'i rnal 'byor or rdzogs chen) Ultimate Yoga; The Great Perfection — often practised in monasteries kept specially for this purpose. In the later schools the inner tantric teachings are known as Anuttarayoga Tantra, which corresponds to Mahayoga in the Nyingma system, while the Mahamudra teachings of the later schools are said to lead to similar results as the Dzogchen teachings. The first two of the nine vehicles are seen as Hinayana, the third as Mahayana and the remaining six as specifically Vajrayana. The eight lower levels have intellectually fabricated and contrived that which is changeless solely due to fleeting thoughts that never experience what truly is. They apply antidotes to and reject that which is not to be rejected. They refer to as flawed that in which there is nothing to be purified, with a mind that desires purification. They have created division with respect to that which cannot be obtained by their hopes and fears that it can be obtained elsewhere. And they have obscured wisdom, which is naturally present, by their efforts in respect to that which is free from effort and free from needing to be accomplished. Therefore, they have had no chance to make contact with genuine, ultimate reality as it is (rnal ma'i de kho na nyid). By now we have seen that Rongzom regards the views of the Sutrayana as inferior to those of Mantra, and he underscores his commitment to the purity of all phenomena by criticizing the Madhyamaka objectification of the authentic relative truth. With the advent of the transmission of Sarma traditions into Tibet, various proponents of the new systems cast aspersions on the Indic origins of much of the Nyingma esoteric corpus. Indic origin was an important component of perceived legitimacy at the time. As a result, much of the Nyingma esoteric corpus was excluded from the Tengyur, a compilation of texts by Buton Rinchen Drub that became the established canon for the Sarma traditions. This means that while Nyingma accept the Tengyur scriptures they also include writings that other schools reject as not being authentic for having no Indic sources—though Sanskrit originals of some have been discovered in Nepal. The Nyingmapas organized their esoteric corpus, comprising mostly Mahayoga, Atiyoga (Dzogchen) Mind class Semde and Space Class (Longde) texts, into an alternate collection, called the Nyingma Gyubum (the Hundred Thousand Tantras of the Ancient School, Wylie: rnying ma rgyud ‘bum). Generally, the Gyubum contains Kahma (Wylie: bka' ma) and very little terma (Wylie: gter ma). The third class of Atiyoga, the Secret Oral Instructions (Menngagde), are mostly terma texts. There are 'eighteen great tantras' (Wylie: bshad pa dang cha mthun gyi rgyud tantra sde bco brgyad) at the heart of the 'Mahayoga' (Wylie: rnal 'byor chen po) tradition, grouped into 'five root tantras' (Wylie: rtsa ba sku gsung thugs yon tan phrin las kyi rgyud chen po lnga), 'five practice tantras' (Wylie: sgrub pa lag len du bstan pa rol pa' rgyud chen po lnga), and 'five activity tantras' (Wylie: spyod pa'i yan lag tu 'gro ba'i rgyud chen po lnga), and the 'two supplementary tantras' (Wylie: ma tshang kha bskong ba'i rgyud chen po gnyis). Together they are known as the Māyājāla. The Guhyagarbha Tantra (Wylie: rDo rje sems dpa' sgyu 'phrul drwa ba gSang ba snying po) is the foremost of all of these and it abridges the content of the seventeen others. Semde (Wylie: sems sde; Skt: cittavarga), the "Mind Series"; this category contains the earliest Dzogchen teachings from the 9th century and later. It includes texts like the Harbinger of Awareness and the Kunjed Gyalpo (Sanskrit: Kulayarāja Tantra; The Great Leveler) Tantra, the most significant of the 'mind' tantras. Twenty-one main tantras are listed, though the Great Leveler contains five of them and other similar texts are included in different recensions of the Mind Section. Longde (Wylie: klong sde; Skt: abhyantaravarga), the series of Space; dating from the 11th-14th centuries. These texts emphasize emptiness (shunyata) or spaciousness. The most important text in this division is "Samantabhadra’s Royal Tantra of All-Inclusive Vastness" (Sanskrit: Mahāvarntaprasaranirajatantranāma). Menngagde (Wylie: man ngag sde, Skt: upadeshavarga), the series of secret Oral Instructions, 11th-14th centuries. This division, including the important "Seventeen tantras", focuses on two major forms of practice, kadag trekchö, "the cutting through of primordial purity", and lhündrub tögal, "the direct crossing of spontaneous presence." According to the Nyingma-tradition, Padmasambhava and his main disciples hid hundreds of scriptures, ritual objects and relics in secret places to protect Buddhism during the time of decline, under King Langdarma, and for when the dharma would need revitalizing in the future. These termas were later rediscovered. The Rinchen Terdzod (Tibetan: རིན་ཆེན་གཏེར་མཛོད།, Wylie: rin chen gter mdzod) is the most important collection of terma treasure to Nyingmapas today. This collection is the assemblage of thousands of the most important terma texts from all across Tibet made by Jamgon Kongtrul Lodro Thaye, at the behest of Jamyang Khyentse Wangpo in the nineteenth century. In contrast to the other three main Tibetan schools, the Nyingma tradition has never been the dominant political power in Tibet, which does not mean that its practitioners were removed from the political machinations of Tibet, and also of neighboring Bhutan, as illustrated by its intimate association with different Dalai Lamas such as the 5th and the current 14th. The Nyingma traditionally had no centralized authority or Nyingma-wide hierarchy. There was never a single "head of the lineage" in the manner of either the Ganden Tripa of the Gelug, the Karmapa of the Karma Kagyu or the Sakya Trizin of the Sakya. Dudjom Jigdral Yeshe Dorje (c. 1904–1987), served from the 1960s until his death. Dilgo Khyentse (c. 1910–1991), served from 1987 until his death. Penor Rinpoche (1932–2009) served from 1991 until retirement in 2003. Mindrolling Trichen (c. 1930–2008), served from 2003 until his death. Trulshik Rinpoche (1923–2011), served from 2010 until his death on September 2, 2011. Selected after Chatral Rinpoche declined the position. Taklung Tsetrul Rinpoche (1926-2015), served from 2012 until his death. Kathok Getse Rinpoche (1954-2018), appointed during the 29th Nyingma Monlam in Bodh Gaya in January 2018, served until his death in November 2018. Dzogchen Rinpoche (b. 1964) appointed during the 30th Nyingma Monlam in Bodh Gaya, India on 15th January 2019. Both Kathok Getse Rinpoche and Dzogchen Rinpoche were appointed as the head of the Nyingma tradition as part of a new system. During a meeting of representatives of the Nyingma school, it was unanimously decided that the leadership of the school would rotate among the six principal Nyingma lineage holders in of three-year terms. Even so, the Nyingma tradition is still politically decentralized and often decisions are made in an oligarchy or community of the senior sangha within a given jurisdiction or locale. Nyingmapa are also historically characterized and distinguished by decentralization and by a supposed political disinterest, with a lesser emphasis on monasticism relative to the other schools, with a correspondingly greater preponderance of ngagpas, uncelibate householders and yogins. The appearance of terma ("hidden treasures") is of particular significance to the Nyingma tradition. Although there have been a few Kagyupa "tertons" (treasure revealers) and the practice is endemic to the Bönpo as well, the vast majority of Tibetan Buddhist tertons have been Nyingmapas. It is held that past masters, principally Padmasambhava, secreted objects and hid teachings for discovery by later tertons at appropriate and auspicious times such that the teaching would be beneficial. These teachings may be physically discovered, often in rocks and caves, or they may be "mind terma," appearing directly within the mindstream of the terton. Special terma lineages were established throughout Tibet. Out of this activity developed, especially within the Nyingma tradition, two ways of dharma transmission: the so-called "long" oral transmission from teacher to student in unbroken lineages and the "short" transmission of "hidden treasures". The foremost revealers of these termas were the five terton kings and the eight Lingpas. The terma tradition had antecedents in India; Nagarjuna, for example, rediscovered the last part of the "Prajnaparamita-Sutra in one hundred thousand verses" in the realm of the Nāgas, where it had been kept since the time of Buddha Shakyamuni. According to Nyingma tradition, tertons are often mindstream emanations of the 25 main disciples of Padmasambhava. A vast system of transmission lineages developed through the ages. Nyingma scriptures were updated when the time was appropriate. Terma teachings guided many Buddhist practitioners to realisation and enlightenment. The rediscovering of terma began with the first terton, Sangye Lama (1000–1080). Tertons of outstanding importance were Nyangral Nyima Oser (1124–1192), Guru Chowang (1212–1270), Rigdzin Godem (1307–1408), Pema Lingpa (1450–1521), Migyur Dorje (1645–1667), Jamyang Khyentse Wangpo (1820–1892) and Orgyen Chokyur Lingpa (1829–1870). In the nineteenth century some of the most famous were the Khen Kong Chok Sum referring to Jamyang Khyentse, Jamgon Kongtrul and Chokgyur Lingpa. Contemporary Nyingma lineages include ethnic Tibetan and other Himalayan teachers as well as Western lamas, and their students. Geoffrey Samuel notes that some of these organizations are international networks of dharma centers and monasteries in the West and in Asia. Some of the largest international Nyingma organizations are Namkhai Norbu's Dzogchen community and Sogyal Rinpoche's Rigpa organization. Other Nyingma organizations include Tarthang Tulku's various projects such as the Tibetan Aid Project, Yongey Mingyur Rinpoche's Tergar Meditation Community and Dzogchen Ponlop Rinpoche's Nalandabodhi. Besides the major monasteries in Tibet, there are also now various Nyingma institutions of the Tibetan exile community in India including Thekchok Namdrol Shedrub Dargye Ling, in Bylakuppe, Karnataka State; Ngedon Gatsal Ling, in Clementown, Dehradun; Palyul Chokhor Ling, E-Vam Gyurmed Ling, Nechung Drayang Ling, and Thubten E-vam Dorjey Drag in Himachal Pradesh. Other living Nyingma teachers include Trulshik Rinpoche, Chatral Sangye Dorje, Taklung Tsetrul Rinpoche, Thinley Norbu, Chagdud Tulku Rinpoche, Dzigar Kongtrul Rinpoche, Lama Gonpo Tseten, Palden Sherab, Khenpo Sherab Sangpo, Khentrul Lodro Thaye Rinpoche, Chamtrul Rinpoche, Khandro Rinpoche, Chökyi Nyima Rinpoche, Togdan Rinpoche. Nyingma tradition has held that there were "Six Mother Monasteries" out of which developed a large number of branch monasteries throughout Tibet, Bhutan and Nepal. There have been slightly different formulations of the six. At one time they included Dorje Drak, Mindrolling and Palri monasteries in Upper Tibet and Katok, Palyul and Dzogchen monasteries in Lower Tibet. After the decline of Palri and the flourishing of Shechen Monastery, the Six Mother Monasteries were Dorje Drak and Mindrolling in the upper region, Shechen and Dzogchen in the center, and Kathok and Palyul in the lower part of Tibet. The last four monasteries are all located in Kham. 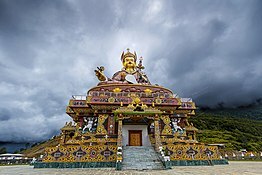 Also of great importance to the Nyingma lineage is Samye, the first Tibetan monastery, which was founded by Śāntarakṣita. ^ Sherpa, Lhakpa Norbu (2008). Through a Sherpa Window: Illustrated Guide to Sherpa Culture. Kathmandu, Nepal: Vajra Publications. ISBN 978-9937-506205. ^ "Mantrayana - Rangjung Yeshe Wiki - Dharma Dictionnary". rywiki.tsadra.org. ^ "The Nyingma Lineage". tergar.org. Retrieved 2016-01-06. ^ Duckworth, Douglas; Mipam on Buddha-Nature, The Ground of the Nyingma Tradition, State University of New York Press, 2008, pg xviii. ^ Germano, David (2002). "A Brief History of Nyingma Literature". THDL. Archived from the original on 2007-12-16. Retrieved 2008-01-15. ^ Koppl, Heidi. Establishing Appearances as Divine. Snow Lion Publications 2008, chapter 4. ^ a b Duckworth, Douglas; Mipam on Buddha-Nature, The Ground of the Nyingma Tradition, State University of New York Press, 2008, pg xix. ^ Garry, Ron (2007). "Drapa Ngonshe". The Treasury of Lives. Retrieved 2017-07-18. ^ Hirschberg, Daniel (2013). "Nyangrel Nyima Ozer". The Treasury of Lives. Retrieved 2017-07-18. ^ Gyatso, Janet (August 2006). "A Partial Genealogy of the Lifestory of Ye shes mtsho rgyal". The Journal of the International Association of Tibetan Studies (2). ^ Duckworth, Douglas; Mipam on Buddha-Nature, The Ground of the Nyingma Tradition, State University of New York Press, 2008, pg xxvi. ^ a b Duckworth, Douglas; Mipam on Buddha-Nature, The Ground of the Nyingma Tradition, State University of New York Press, 2008, pg xxi. ^ a b Koppl, Heidi. Establishing Appearances as Divine. Snow Lion Publications 2008, chapter 4. ^ a b c d e f Sangharakshita. An Introduction to Tibetan Buddhism. ^ Dudjom Rinpoche. Wisdom Nectar. Snow Lion 2005. ^ "News - Kyabje Trulshig Rinpoche Accepts Position As Head of the Nyingma School". www.mindrolling.com. ^ "Kathok Getse Rinpoche Appointed as the 7th Nyingma Head". Central Tibetan Administration. ^ "Nyingma head Kathok Getse Rinpoche dies after accident". Tibet Sun. ^ a b "Dzogchen Rinpoche Jigme Losel Wangpo Selected as Eighth Nyingma Head | Buddhistdoor". www.buddhistdoor.net. Retrieved 2019-04-20. ^ "History, Overview of Nyingmapa, the Oldest School of Tibetan Buddhism". ^ Buswell (2013). Lopez, Donald S (ed.). Princeton Dictionary of Buddhism. Princeton, NJ: Princeton University Press. ISBN 9780691157863. Gyatso, Janet (1999). Apparitions of the Self, the Secret Autobiographies of a Tibetan Visionary. New Jersey: New Jersey: Princeton University Press. ISBN 0-691-01110-9. Padmasambhava Buddhist Center Headed by Kenchen Palden Sherab and Khenpo Tsewang Dongyal with centers around the world and Padma Samye Ling Retreat Center and Monastery in Sidney Center, New York.